Matching Antler Wine Cork Puller available. 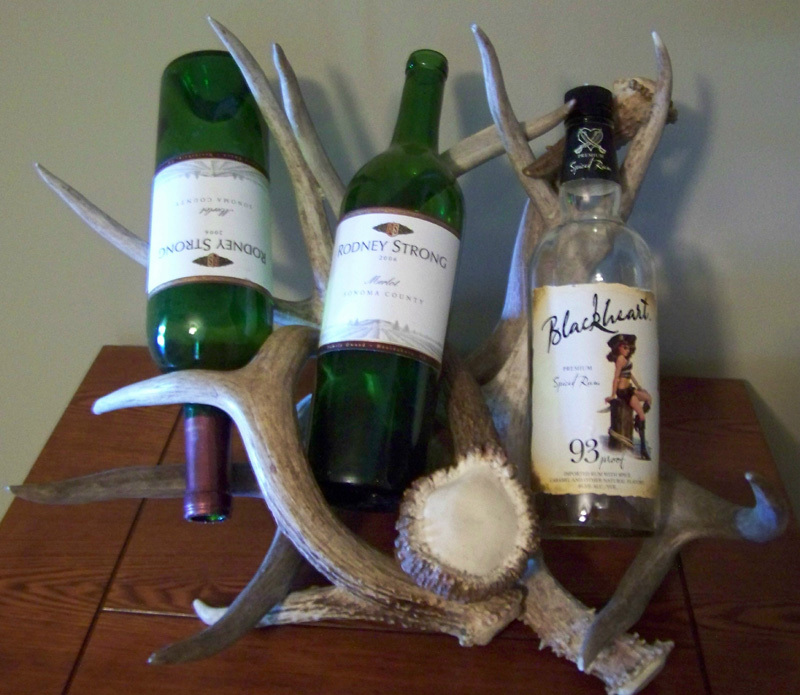 Antler Wine Rack handcrafted with quality Elk, Whitetail and Mule Deer Antler Sheds. Beautifully polished Elk Burr to finish the piece. The Antler Wine Rack is designed to hold several styles of wine bottles and will accommodate bottles to be stored upside down to allow air to remain in the punt for maximum wine storage. Makes a great gift for a sportsman that loves wine! Each Antler Wine Rack is custom made. Due to the unique character of real antlers, each wine rack varies. While each antler wine rack creation is unique, they typically measure 15″ high x 17″ wide x 13″ deep. This Antler Wine Rack makes a great accent piece for cabin, lodge, or rustic decor. This unique piece brings nature to your cabin or lodge in a beautiful rustic way. All of the Antler Art pieces are handcrafted, custom creations – due to their uniqueness, no two are exactly alike. The antler artist is always available to work directly with you to select or design the proper piece for your needs.